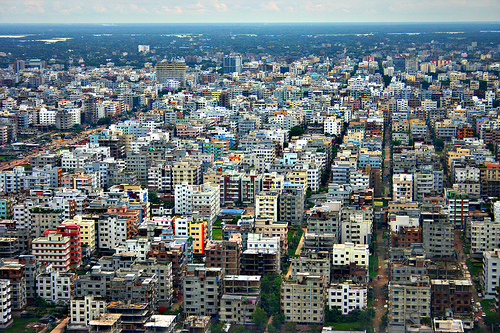 Dhaka City. Source: Sandeep Menon Photography, Flickr. Dhaka has been once again deemed by the Economist as the second least livable city in the world. Damascus came in last only because of the civil war that is tearing the city apart. If the civil war were to stop today, Damascus would become imminently more livable than Dhaka tomorrow. Regardless of our opinion of the Economist or its survey, I don’t think any of us would disagree that living conditions of Dhaka are horrid and are in dire need of improvement. In this article I will try to suggest a few ways to improve Dhaka’s livability. However, before doing so let me say a few words in defense of Dhaka and about the dangers of drawing up schemes for improvement. The things that make Dhaka one of the least livable cities in the world also give Dhaka its life, character, and, may I say, its charm. Dhaka, like many other Third World cities, has shown remarkable resistance to what James Scott called the “high modernist” schemes of designing and governing space. Dhaka is characterized above all by its organic growth. I dare to use the adjective organic in describing a concrete jungle of 15 (or is it 20) million inhabitants only because urban planning has been marginally influential in determining its character. Dhaka gained its current shape as millions sought to convert the space to meet their need to find dwelling and livelihood. In the process they defied all the grids and designs proposed by the urban planners. The beauty of Dhaka is that it functions at all. Every time I go back to Dhaka I am awed by the simple process of crossing the street. Having been habituated in following orders from signals and lights, I think that no one is going to make it to the other side without the signals and lights. But people manage and I also learn very quickly. The kind of organic and personal communication and coordination involved in crossing the streets of Dhaka irks the high modernists but probably would have highly impressed the Situationists, who sought to destroy the disciplinary grids of modern capitalist cities and redesign cities on more humane scale . The situationists also would have been impressed by the way the private and public spaces blur in Dhaka – streets invade homes and homes spill out on the streets; addas and social life occur in middle of those messy spaces. All these are to say that we must be careful about what we wish for. The so-called livable cities may not be all that livable. The regulated, orderly, disciplined, sanitized, compartmentalized, and impersonal cities of the West may turnout to be oppressive or downright inhuman. But of course, grass is always greener on the other side and Dhaka can surely use a little order and a little more amenities of modern life. Dhaka must be made more livable. But for whom? Are we to make Dhaka livable for the middle class waiting in long queues for over-crowded buses? Or, are we to make Dhaka livable for the elite stuck in their air-conditioned cars in the snarling yet slow traffic? Will there be dwellings for millions of garments workers in the improved Dhaka? Or, will Dhaka be a city of high-rise apartment buildings housing the new middle class? Will the footpaths be reserved for the pedestrians? Or, will the footpaths continue to provide the space where millions of “informal sector workers” eke out meager livings? Will Dhaka streets be reserved for motorized vehicles? Or, will the thousands of displaced villagers be allowed to pull rickshaws under the unforgiving hot sun? Each proposal for making Dhaka must navigate through these difficult dilemmas involving contesting class interest. The biggest obstacle for making Dhaka a more livable city has been the fact that the policy makers and the designers have not been interested in making Dhaka a livable city for all classes. Rather, they have sought to improve the city only for the upper and middle classes. But the working classes will not just disappear from the city, for at least two reasons. First, the upper and middle classes will need the working classes to do the work – to do their cooking, cleaning, driving etc. – and will need them to be around. Second, the working classes are being increasingly deprived of sources of livelihood and sustenance outside of the cities and are being forced to come to the cities in search of work and means for survival. So, plans for making Dhaka more livable should stop focusing only on people of Gulshan and also take into account the people of Gandaria. The first step in making Dhaka livable would be to make the rest of Bangladesh more livable. We need comprehensive policies for decentralizing administration, education, commerce, and industry so that other towns and cities around the country can offer livelihood and decent quality of life to people. Such policies will make other cities and towns more attractive to people and reduce the influx of people coming to Dhaka. More importantly, however, we need to make the villages of Bangladesh livable. Thirty years ago more than 80% of Bangladeshis lived in villages and lived off agriculture. The percentage is now well bellow 50. All these people, who are being displaced form the villages, are now coming to the cities; mostly to Dhaka. We need to save Bangladeshi villages by saving Bangladeshi agriculture. Perhaps, it is now time to revise the Green Revolution. Perhaps, it is now time to finally have a land reform program and prevent the aggressive swallowing up of small peasant landholdings by agro businesses. The second step in making Dhaka livable would be to provide safe places to work and live for the millions coming in from various corners of Bangladesh. Government needs to construct thousands of low-rent housing projects to substitute for the shantytowns constructed on occupied public lands and infrastructures. More hawkers markets and designated spots where street vendors can do their business would go a long way in providing safe and stable spaces to make a living. Thirdly, we will have to provide better security for the residents of Dhaka. The rise of private security industry is indicative of the dire security crisis in Dhaka. However, only the wealthy can afford private security and the rest are condemned to live in constant fear. We need to invest heavily on providing more public security against burglary, mugging, and harassment. Perhaps, auxiliary security force like the Ansars can provide neighborhood watch services to supplement the Dhaka Metropolitan Police. Fourth, the transportation system of Dhaka has to be overhauled. Currently the focus is on building fly-overs and making car travel easier and faster. It is a completely wrongheaded policy given that only a small percentage of the population has access to cars and the global oil crisis is most likely to make cars obsolete in the next 20 to 50 years. We need long term strategic planning that focuses on energy efficient mass transit system based on a network of boats, trains, and buses. To supplement long distance mass transit system we need to enable local/short distance travel by foot, bicycles, and rickshaws. That means creating and keeping clear footpaths, walkways, and bicycle and rickshaw lanes. Fifth, we need clean, safe, and accessible public spaces in the forms of parks, playgrounds, and public squares. We need to clean up the existing ones and create some new. Here we need to pay special attention to ensure equal access to these public spaces for both genders. There are very few places for adda in Dhaka to begin with and if you are a woman the situation is even more dire. In talking about public spaces, we need to make the steps of the parliament building available to people again. And since we are dreaming, a massive urban development and conservation project should be undertaken to create a promenade on the Buriganga and turn the adjacent Old Dhaka into a walking city housing artisan shops, craft workshops, galleries, restaurants, cafes, etc. Okay, I can go dreaming up ways to make Dhaka more livable. But I will stop here. Dhaka is a wonderful city; it is my first love and I think it is full of life, love, and character. But no doubt it needs improvements. And, improvements or any kind of change requires political will. By political will I do not simply mean the will of a political leader or the vision of some bureaucrat. By political will I mean the will of the people. The changes outlined or wished for above may be achieved, if people demand it and work for it. As intellectuals and commentators all we can do is to provide the platform where people can come together to forge the vision of the beautiful city they want to live in. Dhaka will not be made livable by a charismatic leader or an enlightened urban planner. If Dhaka is to become a livable city, the people of Dhaka will have to make it so. Scott, James C. Seeing Like a State : How Certain Schemes to Improve the Human Condition Have Failed. New Haven: Yale University Press, 1998. Sadler, Simon. The Situationist City. MIT Press, 1999. Next India sneezes, will we catch the cold? Although your theories provide us with ways of making Dhaka livable, it changes Dhaka from it being Dhaka (as you have explained). What I find problematic about designating Dhaka the second most unlivable city is the fact that there is more then one way to live. Dhaka might be considered from a western perspective to be unlivable, yet more then 15 million people do live there and 15 more millions looking for a tiny space that they could possibly call home. I guess there needs to be a better understanding of the qualifications that makes Dhaka such a unlivable city. Would it be considered more livable if it had 1 family living in a square mile? Or if the buildings were made of glass? How can we take the people living there and ignore them and just call it unlivable? We must not hesitate to admit that there are problems and we must not resist change just because it will change things. However, we must be reflective about how something comes to be designated as a “problem” and we must carefully consider the consequences of proposed “improvements”. I am not proposing that change is always bad, but the idea that just because a westerner calls the city unlivable, we must buy into his theory. First of all, someone who have lived in Beverly Hills may call new york city unlivable, so it coming from a westerner sounds very uninformed. I would like to zee the perspective of the people thats living there and if they still call it unlivable. We must also accept that the phenomenon of a large mass of the population conjugating in one particular location is a universal problem, and it is not the living qualities of the surrounding areas that makes it so. Just the name “Dhaka”, similarly to the name “New York”, is enough to drive in people. The overpopulation of New York doesn’t arise from the unlivable conditions around the city, it does because New York is a modern metropolis. Lastly, what you’re proposing is the solution to most overpopulated places. If we all follow these “western” ideologies of how each nation should construct itself, then in the not-so-distant future, there is a possibility of an Orwellian Society, where ‘difference’ goes parallel with ‘bad’. All the ideas above are age-old and well-known to the admin of Dhaka, problem with whom is that, they only live for today and care little for tomorrow, hence no change. The whole idea of unplanned living, zoneless growth and uncontrolled movement will bring Dhaka to a massive standstill – too late to resolve, and will itself be the source of collapse for the whole nation. Life may be glorius today with buzzing rickshaws and elevated apartments – – but with no gas, electricity, water and transport due to unplanned growth – if Dhaka is unlivable today it will be totally dead tomorrow – just a matter of time. With corruption at “the worst” and planning “most unlivable” – the correlation between corruption and liveability is clear. What needs to change is corruption, politics and Rajuk. I agree with you mostly. Corruption is a problem of course. However, I see corruption is a symptom of a problem, corruption is the the result of a deeper problem. That deeper problem I think has to do with Bangladesh’s political structure and culture. A big problem is that Bangladesh’s politics is dominated by handful of elite families with the help and support form lackey (chamcha) middle-class. The rulers treat the country and the state apparatuses as means to gain personal (family) wealth. They get rich and throw some bones to the chamchas every now and then. That’s corruption. And, it is pervasive and more or less accepted by most people in the country. In order to tackle this corruption reform in one or two institutions like Rajuk or reports published by Transparency International will not be enough. Corruption is a political problem and will need political solution….. Bangladesh will have to become a real democracy… that is to say the poor and the working classes must be able to make political decision. A refreshing article on why we don’t have to see Dhaka with a Western eye. However, the author should address why there has been so much in-migration into Dhaka and how that could have been avoided. Better development policies would have allowed more smaller cities to emerge so that the difference in size between Dhaka and even Chittagong would not be so large. Dhaka is one of the worst examples of a megacity today and it was a beautiful city even in the 1970s. Thanks. I agree that in-migration is the biggest problem and must be addressed. I touched on this briefly in the 4th paragraph of the article. Dhaka is the longest 5th Avenue of the world! Just too slow to run and too fast to harness! I don’t how to make sense of that completely. However, I think you are on the right track… the sheer size of city like dhaka makes it ideal for capitalist expansion. Just think how much business opportunity is there in a city of 15 or 20 million people (even if most people are poor). Just look at all the glitzy new shopping malls and apartment complexes, some people have lots of money…. and if you are clever businessman you can make lots of money out of the teeming masses of city. But I think you were being ironic in that comment. And I don’t also want people to treat Dhaka as simply an opportunity to make money. The most un-liveable city is NOT a description through the western eye. It is a view through the HUMAN eye. Dhaka is a lovely city, only in the high-rise marble air-conditioned apartment. But imagine yourself living in a tin shed in the slums of Dhaka, which more than half of Dhaka residents do – then you may vision how in-human life in Dhaka is. Words that better describe the majority life in Dhaka are “millions, adversity, anguish, difficulty, discomfort, hardship, misery, misfortune, ordeal, suffering, torment, torture, affliction, distress….”. Lets not be insulted by the true description of majority Dhaka, but lets take necessary action to make this city more liveable for the majority. Completely agree. However, I was just raising questions about what we would consider not only livable but also good or beautiful city. And, I tried to argue that we should not envision what is better from a Western perspective or that matter from the perspective of the elite of the Dhaka. I am afraid that currently most visions of development or improvement are limited by our tendency to copy the West and by the propensity to mostly benefit the upper classes. So, we need visions of development/improvement that does not necessarily take the West as a model, that comes from the perspective of the poor and working classes, and that serves the interest of the masses (not the elite). Your comments about western eyes make me laugh…and weep. Open your own eyes and see the reality. Dhaka is a filthly, polluted, corrupt, stinking home….is that clear enough for you ? Is it a reply to the article? Which comment about Western eyes? I don’t think I ever used the phrase. Only the last two sentences of second paragraph mention the West. I suggest you read that section and the article again. Since you are taking the trouble to read and comment on the article, why not take it seriously? Dhaka is a filthy, polluted, corrupt, stinking “home”…. yes, true. But Dhaka is not just that. Dhaka has its beauty and charm also. But more importantly, how do we make Dhaka better and for whom? The article tried to raise and answer (admittedly very superficially) these questions. To me the key words in the article are “Every time I go back to Dhaka…” – it means that this guy lives abroad, not in Dhaka, and hops in for 15 days with the luxury of leaving it for the nice, clean safe West and somebody who has the luxury of feeling the ‘charm’ of this hellhole. Please spare us regular inhabitants all this garbage about the charm of Dhaka. You are absolutely right about my access to the luxury of leaving Dhaka. However, I don’t think that luxury hinders my understanding. I had lived in Dhaka for many years. Every time I go back, it is not for days but for months. And, I do not stay in Gulshans or Dhanmondis of Dhaka but in Mirpurs and Tezkuniparas of Dhaka. So, I think I have a fair idea of life in Dhaka despite my access to escape. But more importantly, I think my life abroad have given me a better perspective to not only appreciate Dhaka but also to critique its visions for improvement. My appreciation of Dhaka is not simply nostalgia or cheap romanticization, it is political. My point is that we should not think that everything in Dhaka (or in Bangladesh or in the Third World) is bad, outdated, dysfunctional, etc. and, thus, in need of change. Of course there are problems and we need to find solutions to them. However, trying to imitate examples of Western, developed, capitalist countries will not lead us to a good solution. We need different imaginations of the solutions to our problems. Well said. This “don’t write about Dhaka because you have left” argument is tiresome, kneejerk, and pointless. With all due respect, unless I am mistaken, you are making the Fox news vs. Reza Aslan argument. The Fox News analyst found him unqualified to write about Christianity being a Muslim. You are castigating the writer for living abroad – and imply that he is unaware of Dhaka’s realities because he does not live there at this point of time. That’s a lot of assumptions you make about the writer’s knowledge of the city and past experiences with it. I am deeply sympathetic to your frustrations and have often felt them myself – but the question is, do you sit and keep cursing out the place where you live, or do you find a way to move forward and make your life there as pleasant as possible? The ‘most un-liveable city’ title does NOT mean that “everything is bad, outdated, dysfunctional, etc.” it is a rating of criteria like housing, transport, medical service, corruption, police force, governance, etc which gives a city ‘the Quality of Life’ necessary for best comfort, survival and health. Dhaka happens to have comparatively one of the worst amenities in the world in those criteria. Every human being needs safety, health and modern transport – its not a question of “western solutions. If we can use “western” cars, medicine, electricity, and fashion in Dhaka, why cant we also utilize “western” police, anti-corruption, transport systems, governance and city management ? Why are you prescribing under-developed EASTERN methods when the west is so advanced and when we can avail those methods to develop Dhaka ? Why are you suggesting that Dhaka un-invents the western wheel ? Completely agree with this comment. I understand what the author is trying to convey, but I feel he has slightly over-stated his point. There are reasons why Dhaka is looked at as an undeveloped city, and these reasons are simply a matter of infrastructural fact. Having access to toilets and sanitation for as much of the population as is possible isn’t a “Western” concept; it’s simply an engineering [and financial] solution to the problem of waste disposal. We could think of other ways, for sure. But the very fact that we are relocating our waste somewhere else is in itself “inorganic”, and a form of human engineering. The concept need not intrinsically be a cultural import. Sure, think carefully about designing the city so that you retain whatever “charms” you wish, but it’s daft to suggest the “charm” of Dhaka outweighs the infrastructure deficit, when it clearly doesn’t. After all, the author lives abroad, let’s say in Vancouver/Melbourne, rather than a Canadian/Australian citizen living in Dhaka. That alone speaks volumes. There is one area where I totally disagree with western ‘projects’, and that is in the massive government procurement of huge western equipment in the name of ‘development’ but without any planning, forethought or popular agreement. And that is where govt makes big money in corruption, by buying huge ‘white elephant’ projects from abroad that are big loss-makers for the economy, and massive failures for the people. If Humayun means these type of projects, then I agree, such blatant white-elephant westernization is a BAD idea. Govt loves these huge projects, its an easy way of making large chunks of corruption bribery – 12% of $3bn is $360 million and with a single project like a bridge or nuclear power plant, that kind of bribery is what makes 3rd world govts excited ! The problem is – just buying a white-elephant project does not mean success for the city, just buying a few aeroplanes does not make a viable airline, or building ‘flyover-road’ does not mean smooth traffic flow. A working system needs to be developed – and with a good system, transport can occur without huge expensive flyovers, or underground metro lines. However, there are unlimited resources available in the west which can quickly transform Dhaka, without spending mega-millions, but govt is NOT interested – why ? because govt makes no money (under the table) in such low-money projects, and so Dhaka continues to decline. Some of the ideas put forth about how to improve Dhaka are quite valid, however, until such time as there is a change in the attitude of the Bangladesh people, neither Dhaka nor the country has any chance of improving i.e., everything bad that happens in Bangladesh, whether it be land grabbing, horrific driving, people being killed raped and robbed, filth in the streets and waterways, workers being abused and tortured, omen being tortured and killed for dowry etc etc. ; is caused by the incredible selfishness of the people. The all pervading attitude is “I will look after myself, and do what I want, regardless of the consequences for my fellow man (and woman”. This attitude exists in everyone and is learned from a very young age. I have lived and worked in numerous countries around the world, and have never come across a nation of people so self centred and uncaring towards their fellow man, as Bangladesh. Fix this and you might have some chance of improving the country, anything else in the meantime is a waste of time, effort and foreign donor money. In the meantime, Dhaka and Bangladesh will continue to be the complete and utter arse-hole of the world!!!!!!! Your comment is as moronic as it is simply incorrect. You have a comic-book understanding of how the world works, and it’s odd that you would take Bangladesh to be the “arse-hole of the world!” when it is rather safe, economically vibrant and sanitized at it’s rate of per capita income when comparisons are made to other countries in this category. A lot is wrong with Bangladesh, but they’ve also managed to get a lot of things right too.